Savanna Madamombe rides on the back of her brother's truck in Harare. She says she wants to seize this moment in Zimbabwe to show people they can hold their leaders accountable. 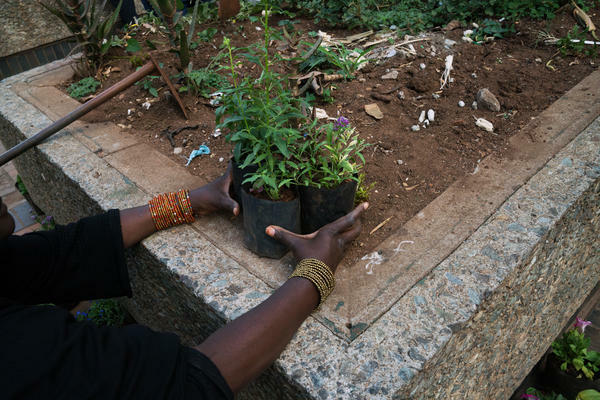 "In good faith, I want to plant some flowers, do something small," Madamombe says. "Blooming flowers to me speak of a new life." 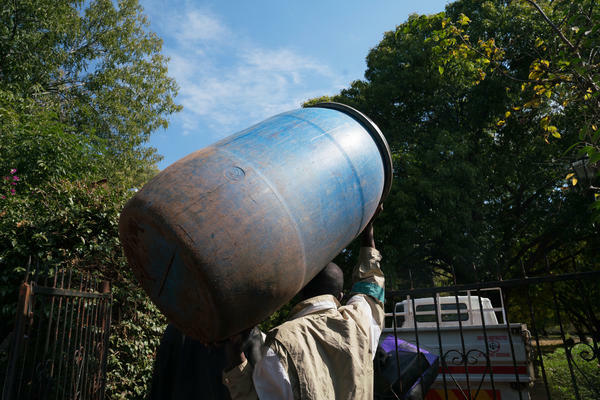 Enyway Chatambudza, 33, carries a container to fill with water on the way to plant flowers in Harare. Savanna Madamombe grew up in Harare but lived in New York for the past 17 years. Following Robert Mugabe's ouster, she returned to Zimbabwe's capital last December. Savanna Madamombe walks into a plant shop in Harare, Zimbabwe. She has purchased over 450 flowering plants using donations to clean up city planters. 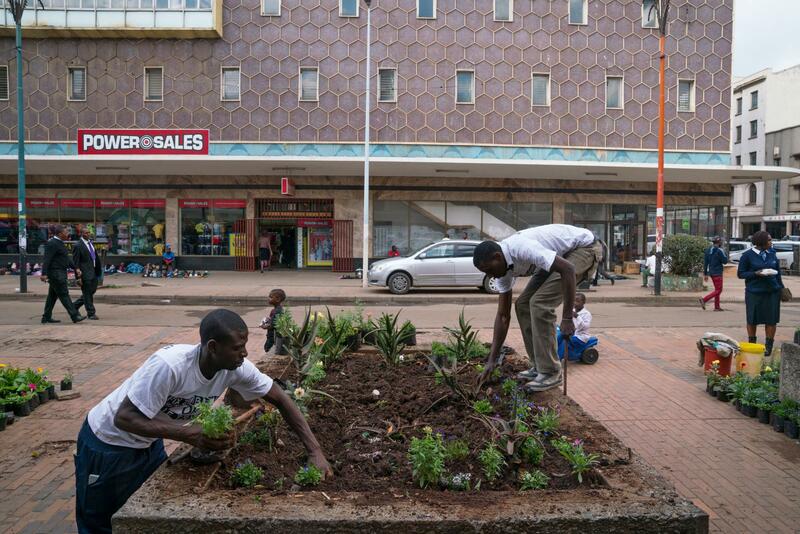 Enyway Chatambudza (left) and Kuda Ndanga plant new plants in a previously untended planter on First Street in Harare. 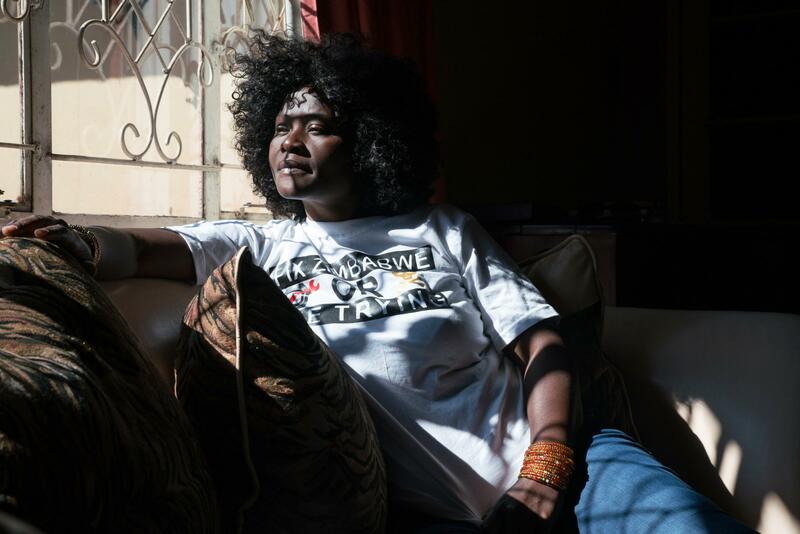 Madamombe's activism in Harare is all about drawing attention to the ways the city has deteriorated in the past few decades, partly because of economic collapse but also due to inaction in the city council, she says. 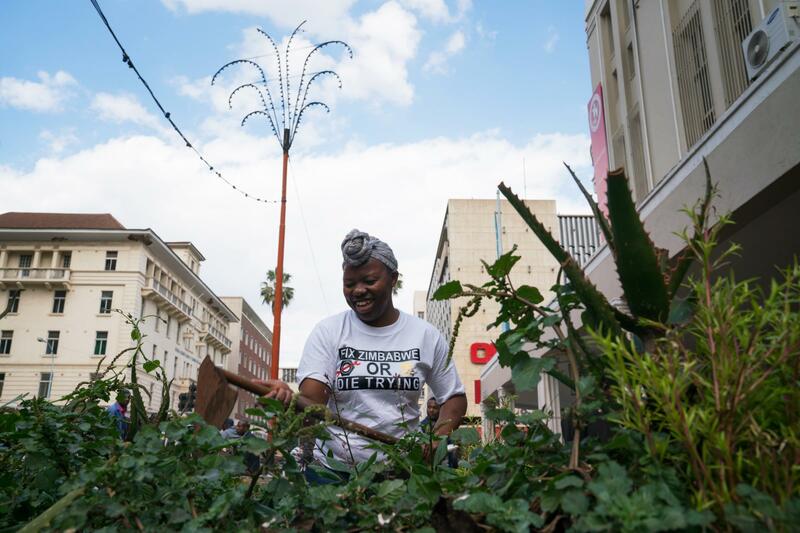 Amanda Murombo, Madamombe's niece, works in a planter in the center of Harare. The planters had been full of trash and weeds. Savanna Madamombe's sister Christina (left) and Kuda Ndanga (right) record a video of Savanna while she is planting flowers in downtown Harare. So she got on Facebook and started speaking out, talking to other members of the Zimbabwean diaspora. She organized protests with hundreds of people when Mugabe visited the United Nations last year. And she live-streamed all of it on social media. All of this meant that it was too risky to return to Zimbabwe to see her family while Mugabe was in power. Under Mugabe, who ruled for 37 years until last November, police routinely used excessive force to snuff out dissent, rights groups say. Law enforcement violently crushed peaceful protests and arrested opposition activists. Prominent critics were beaten and sometimes mysteriously disappeared. But last week, Madamombe, 49, sat in her sister's house in Harare, beaming as the low winter sun streamed through the window. When a military takeover resulted in Mugabe's ouster last November, he was replaced by Emmerson Mnangagwa, a former member of Mugabe's cabinet. Despite concerns over Mnangagwa's own human rights record, the new leader has taken steps to lift restrictions on free speech and pledged for a more open Zimbabwe. He also promised fresh elections in July — the first without Mugabe's name on the ballot since the country gained independence in 1980. Madamombe saw her chance to come home. In December she did, and she brought her activism with her. She says she views this as a moment of opportunity for the country, and she wants to seize it to show people in Zimbabwe that they can hold leaders accountable. "I know for sure that if it was still Robert Mugabe, I would never dare to do it," she says, referring to her activist work. "The Mugabe era is gone, and it's something that can't ever be allowed to come back." 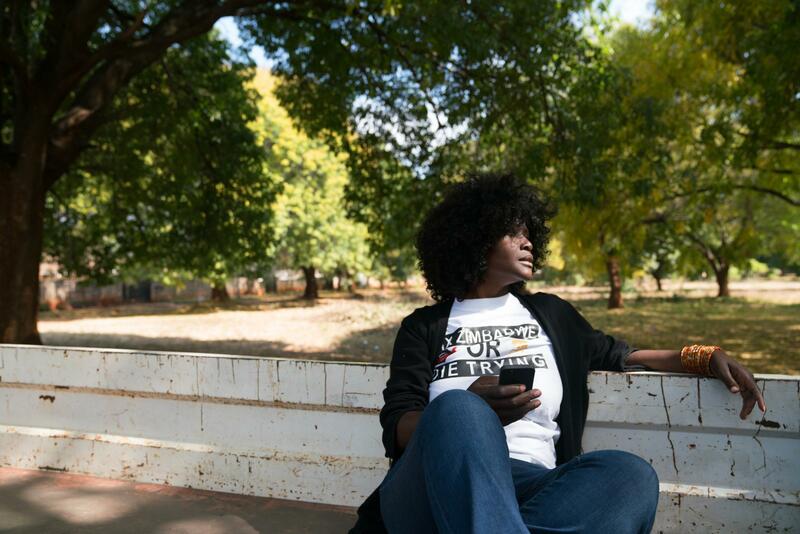 Her videos in Harare are all about drawing attention to the ways the city has deteriorated in the past few decades, partially due to economic collapse, but also due to inaction in the city council. She walks through the center of town, live-streaming on Facebook, pointing out piles of trash and crumbling buildings. And she calls out city councilors by name, tagging them in her posts. In the six months that she's been doing this, she hasn't been arrested — or even questioned by police. But when NPR visits her, she has a broader project in mind, one that she had been planning for weeks. She's going to First Street, a boulevard of shops and restaurants in the city's central business district that was once a destination but is now in disrepair without proper upkeep. Her main focus: Giant concrete planters, once filled with plants, now full of trash and weeds. "In good faith, I want to plant some flowers, do something small," she says. "Blooming flowers to me speak of a new life." 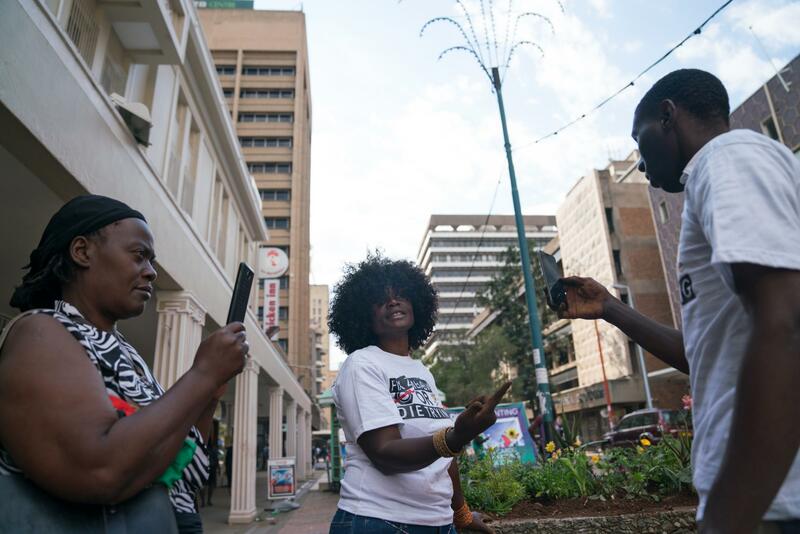 She piles into the back of her brother's flatbed truck, along with team of mostly family members, and as they rumble along Harare's pothole-filled streets, she streams a video. "Hi guys, I know I haven't done a live video in a bit," she shouts over the engine noise, greeting her social media followers as they tune in. "Good morning Mark! Hi Jacob. Hi Sam! Do me a favor, guys — share the video!" The views and shares on her videos are routinely in the hundreds. One from a New York City protest last year drew more than 30,000 views. 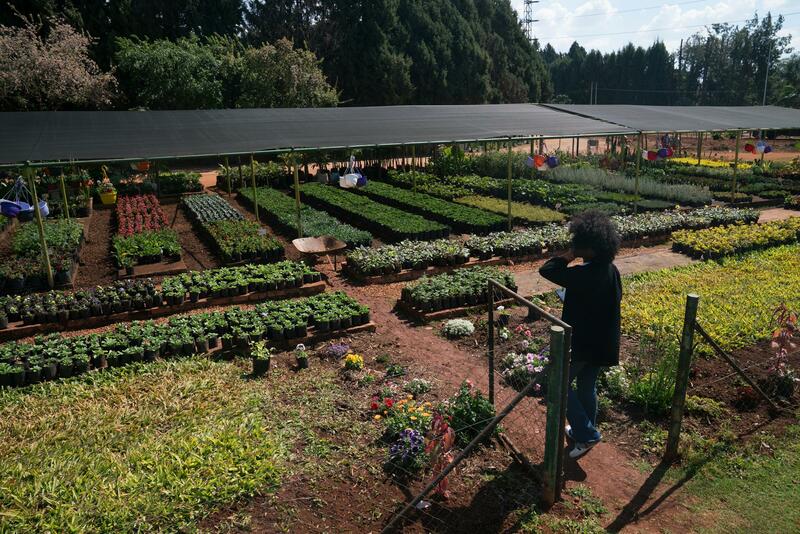 A short while later, the truck pulls over to a roadside flower nursery, and Madamombe hops out, instructing the staff to pile the truck bed full of flowers. Over 450 pansies, snapdragons, petunias, violets and marigolds are carefully lined up, ready for the journey downtown. Madamombe pays for all of it through donations, carefully counting out a mix of U.S. dollars and Zimbabwean bond notes — and, of course, live-streams throughout the transaction. When they arrive at First Street, it's lunchtime. People crowd the sidewalks, leaning on the giant planters, eating food from street vendors. Madamombe and her team get to work, jumping on top of the planters, picking out empty liquor bottles and napkins, and hoeing the dry clumps of dirt. They're wearing matching T-shirts with "Fix Zimbabwe or Die Trying" stenciled on the front. Madamombe had them made at a local shop. In most cities, this would not be revolutionary. In Harare, it was unheard of, until recently. Any form of protest, however small, could elicit a violent response from authorities under Mugabe. Even planting flowers in a public space. Bystanders stop to stare and ask what's going on. They offer suggestions or give her words of encouragement. It doesn't take long until someone jumps in to help. Kuda Ndanga is a 25-year-old artist waiting for a friend, headphones in, staring down at his phone. As the team starts to unload the flowers, he slowly puts away his headphones and quietly approaches Madamombe. She throws him a T-shirt and motions to the truck. Within minutes, his hands are covered in soil. "No one would ever think of doing this, which is cool!" he says with a laugh. "It feels good to be helping." Madamombe and her guerrilla gardening crew work well into the afternoon, and she tirelessly interacts with people as they walk by. She hands out her phone number for people to join in next time, and asks business owners on the block if they'll help care for the plants and make sure to water them. By the end, the trash is gone and the planters are transformed into a rainbow quilt of new life. Samuel Nyawaranda, 44, works in the area, and he's out running an errand, counting coins on the side of the planter. He sees Madamombe at work and approaches her to tell her how much he appreciates it. He says he thinks this is all part of the new Zimbabwe so many people are hoping for, after elections next month. "You know, when everyone is expecting a change, even the environment needs to be changed," he tells her. Days later, the flowers are still there. Madamombe has been watering them every day, with water from a broken pipe down the street. A man who runs a sidewalk stall selling shoes across the street is also helping protect the flowers. He picks out trash and says he wants to make sure the planters don't go back to the way they were. Councilman Rusty Markham is one of the city councilors regularly tagged in Madamombe's videos to draw officials' attention to protest issues. He says he likes what she's doing, but warns that Zimbabwe is far from a free and open democracy. "It's outspoken, it's activism in its truest form," he says. "One of my slogans is, 'Just ask the question.' Because people stopped asking the question. Now, if you get stopped by someone who wants a bribe or a fine or something, say, 'Why do you want it from me? What have I done wrong? Show me.' No one does that." Zimbabwe has huge national problems — a cash shortage, corruption, a broken economy, to list a few. A recent explosion at a political rally for Mnangagwa left two dead, and several wounded. So what can a few flowers really accomplish? "Forget the flowers," Madamombe says, shaking her head. "It's a symbol. I'm hoping this will start a conversation. That's essential. That has been gone for a long time." For the first time in decades, people in Zimbabwe are speaking their minds without fear that security services will knock on the door and take them to prison. Robert Mugabe ruled the country for almost 40 years. Last November, the military forced him out. And now Zimbabwe has a feeling of openness that most of the population has never experienced before. Our co-host, Ari Shapiro, is there on a reporting trip ahead of elections next month, and he joins us from Harare with a preview of some of the stories we'll be hearing from him. Hey there, Ari. ARI SHAPIRO, BYLINE: Hi, Mary Louise. KELLY: I have to start, Ari, by saying I'm so glad you and the rest of our team there are safe. Y'all had a scare this past weekend. SHAPIRO: Yes. We were at a presidential rally on Saturday, and about half an hour after we left the rally, there was an explosion that killed a number of people. But I have to tell you, compared to past elections in Zimbabwe, the run-up to this one has been really peaceful. And more broadly, when you talk about freedom of expression, Zimbabwe feels very open right now. It's my first visit here, but journalists who've been here before tell me about, under Robert Mugabe, having to work in secret, sneaking into the country on tourist visas, interviewing sources in the back of a car. And over the last week, we've been walking the streets of Harare with our microphones out, asking people questions in public. They're willing to speak to us on the record using their names, even criticizing the government. KELLY: Wow. That is a huge change, even from a year ago. And I know, as you say, you've been talking to a bunch of people, hearing all their stories about how life has changed and keeps changing in Zimbabwe. You've got one of these stories you're going to share with us today. SHAPIRO: Yes. It's about a woman named Savanna Madamombe. She's a Zimbabwean who holds a U.S. green card. And the story I want to tell you actually begins in the United States in Manhattan. UNIDENTIFIED PROTESTER: Mugabe must do what? SHAPIRO: Savanna's in her late 40s, but she doesn't look it. An enormous halo of curly, black hair frames her mischievous smile. She grew up in Harare, but the job market here is so bad that she moved to New York almost 20 years ago. And the sound that you're hearing now is video of a protest that she organized. When Robert Mugabe came to visit the United Nations in New York, Savanna got people together to march and demonstrate against his brutal, oppressive regime. She always streamed her activism live on Facebook. SAVANNA MADAMOMBE: Get up. Speak before they knock your door, before it's your brother. SHAPIRO: Her protests meant she could not return to Harare to visit her family. Under Mugabe, she could have been arrested and beaten like other activists in Zimbabwe. She didn't have much hope of going back anytime soon. MADAMOMBE: We're already gearing up, like, thinking the next five years we'll still be going at the U.N., demonstrating or doing whatever we can. SHAPIRO: And this is Savanna Madamombe at her family's house in Harare just a few days ago. When the military forced Mugabe out in November, she came back to see her family and decided to stick around, bringing her activism with her. MADAMOMBE: I know for sure if it was still Robert Mugabe I would never dare to do it. SHAPIRO: In Harare, she walks through the center of town live-streaming on Facebook, pointing out piles of trash and crumbling buildings. And she calls out city councilors by name, tags them in her posts. In the six months that she's been doing this, she hasn't been arrested or even questioned by police. MADAMOMBE: A lot of people thought I was crazy, but a whole lot of people thought it was inspiring. The Mugabe era is gone, and it's something that can't be ever allowed to come back. SHAPIRO: And is what you're trying to do here - making sure that that change stays permanent? MADAMOMBE: Yes. We've been allowed to speak. It's up to us now to grab it and say, look; every day we are being told it's peaceful, so let's create the peace. SHAPIRO: And she's having a real impact. Like, in one video, she pointed out a fountain in the middle of Harare that was overflowing with trash. MADAMOMBE: When I went back because I wanted to see how long it would take for this to be - I found it cleaned out. SHAPIRO: A city council member confirms that they cleaned up the fountain because of Savanna's video. On the day that we spent with her, she has a bigger plan. She's going to First Street. MADAMOMBE: That essentially was the highlight of our city, Harare. SHAPIRO: The grand boulevard, the center of town. SHAPIRO: In New York, yeah. MADAMOMBE: Exactly. So this is First Street. MADAMOMBE: In Harare. And when I grew up, this where as a teenager I'd meet boys. SHAPIRO: That was more than 30 years ago. Today, First Street is run-down from decades of poverty and neglect. Big, concrete planters are full of trash and weeds. Savanna has a plan to clean them up and fill them with flowering plants. We pile into the back of her brother's flatbed truck. MADAMOMBE: Hi, guys. I know I haven't done a live video in a little bit. SHAPIRO: As we rumble along Harare's pothole-filled streets, she starts streaming a video. MADAMOMBE: What can I say? This is Zimbabwe. SHAPIRO: We pull up to the nursery, and Savanna tells the workers to load up the truck with flowering plants. She collected donations online to pay for them. MADAMOMBE: Blooming flowers to me speak of a new life. SHAPIRO: They load crates into the back - petunias, snapdragons, violets, marigolds. On the Facebook video, she asks her niece, Amanda Murombo, what she imagines First Street could look like. AMANDA MUROMBO: I want it to be the biggest street in Harare. I want every street to want to look like First Street in Harare. That's what I want it to be like. Rent on First Street should be super expensive. SHAPIRO: By the time we're ready to go, more than 450 flowering plants are in the back of the truck. Well, should we go to First Street? MADAMOMBE: Let's go to First Street. SHAPIRO: The street is crowded with people, but there are bricks missing from the sidewalk. In the planters, there are empty bottles of cough syrup with codeine that people use to get high. Savanna and her friends get to work in matching T-shirts that say fix Zimbabwe or die trying on the front and we the people on the back. In most cities, this would not be revolutionary; in Harare, it's unheard of. So bystanders stop to ask what's going on. KUDA NDANGA: No one ever think of doing this, which is cool. SHAPIRO: Kuda Ndanga is a 25-year-old artist, and while he waits to meet a friend, he grabs a hoe and starts plunging it into the dirt. NDANGA: It feels good (laughter) to be helping. SHAPIRO: While they keep planting the flowers, we walk up the street to meet one of the city council members Savanna tags in her Facebook posts. RUSTY MARKHAM: I'm Rusty Markham. I'm third or fourth generation Zimbabwean. SHAPIRO: Is it pretty unusual in Zimbabwe for somebody to do the kinds of things that Savanna is doing? MARKHAM: Yes, very unusual I think. It's activism in its truest form. MARKHAM: And I like it. SHAPIRO: Is it something that would have been dangerous with Mugabe still in power? MARKHAM: Put it this way - in 2008, I don't think she could have done what she's done. Yeah. SHAPIRO: More than half of the population of Zimbabwe has only ever lived under Mugabe, which was a regime that taught people that if they stuck their neck out and made noise, they put themselves in danger. So what do you think will be required to teach people that now they can take matters into their own hands and they can do the kinds of things that Savanna is doing? MARKHAM: I think the urban population is pretty much well on that road. The problem is the more conservative, rural areas, the penetration into there is going to be very slow. But it's happening. SHAPIRO: When we get back to First Street, the planters are transformed into a rainbow quilt of new life. The trash is gone. And more people have joined in. Samuel Nyawaranda is 44. SAMUEL NYAWARANDA: You know, when everyone is expecting a change, even the environment itself needs to be changed. SHAPIRO: Even the environment itself needs to be changed. Zimbabwe has huge national problems - cash shortages, corruption, a broken economy. So what can a few planters of flowers really accomplish? Savanna Madamombe says it's not about the flowers. MADAMOMBE: Forget the flowers. It's a symbol, hoping that this will start a conversation. SHAPIRO: A conversation between citizens and their government. A few days later, we went back to First Street to check on the planters. The flowers were still flourishing. A man who sells shoes on the street corner told us he's looking after them. He doesn't want the street to go back to the way it was. KELLY: That's our co-host Ari Shapiro in Zimbabwe. Next month, we will hear all of his reporting from there as the country prepares for elections on July 30. Transcript provided by NPR, Copyright NPR.